Proper pad level, punch and executing back step. When executing a double team, proper pad level, punch and finish with specific targets for each individual offensive lineman. The mobility of The Colt® allows offensive lineman to finish their drill at the proper pad level and speed. Separation, pad level, punch and finish at full speed. The arms on The Colt football blocking pad give the offensive lineman specific targets to get inside hand position with an arm-under move. Execution any time of year with the perfect fit. Proper pad level, punch and finish. Whether it’s run blocking, pass blocking or footwork, The Colt blocking pad is the best accessory to transform better practice into better game performance. Enhance hand placement and one-handed or two-handed punch with copious repetitions of the Colt. Your offensive lineman will be unstoppable against defensive lineman or linebackers. Find out how The Colt is miles ahead of the competition. Take a look at how it compares with other traditional blocking pads. Advanced blocking techniques involve much more than single head-to-head matchups over the course of a play. Zone blocking schemes require excellent vision and anticipation of an approaching defender. 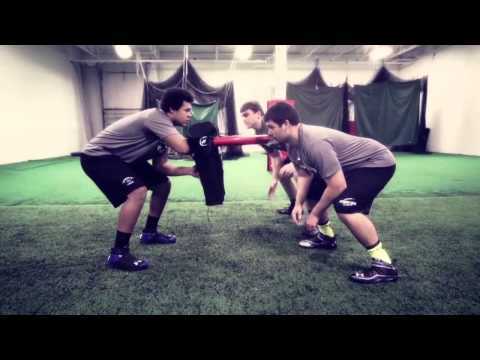 The Krausko Colt football blocking pad exposes linemen to full speed reps handling multiple levels of defenders. Holding penalties kill drives. Offensive linemen developing bad habits of grabbing and pulling will have nothing but problems as the quality of the competition continues to rise. The Krausko Colt blocking pad helps offensive linemen get used to placing hands correctly on a swimming, ripping and driving target to ingrain proper technique in pass and run blocking. Footwork is the name of the game when it comes to opening holes for runners, keeping your quarterback off his back and avoiding crucial penalties. Linemen need to be agile and quick on their feet to win the position battle and keep defenders in front of them. The Muzzle blocking gloves forces linemen to use their feet instead of their hands to control attacking defenders. Contact offensive linemen training experts at Krausko LLC for more information on our revolutionary training equipment. un their drills effectively – fast, hard and safe. Full speed drills are a must to replicate game conditions. Fast contact drills also boost proper muscle memory. But fast, full-contact drills are more likely to cause injuries. Players know this, too. No one wants to be injured during practice. Players often hold back, not wanting to hurt their practice partner. Coaches always want to avoid injuries, especially if the squad is thin at a particular position. The Colt Shield from Krausko Sports makes possible full-contact blocking drills -- with or without pads – at full speed but in a manner most likely to avoid injury. Players greatly improve blocking techniques while remaining healthy for the big game. Coaches really appreciate “The Colt” Shield from Krausko Sports because players actually enjoy blocking drills, instead of dreading them. Players are excited about challenging drills. They can be more aggressive, effective and violent in their moves. Teaching proper technique and attitude is a key to developing a winning tradition. In addition to avoiding physical damage, “The Colt” Shield is an effective piece of football training equipment for keeping wear and tear to a minimum. Players do not want to leave their game on the practice field. Neither do coaches. Neither do fans! “The Colt” Shield from Krausko Sports is your revolutionary choice to greatly improve the effectiveness, quality and safety of every practice. Maximize the realism of your practice drills by adding the Target Jersey Upgrade. The problem with traditional blocking equipment is defensive linemen and linebackers don’t stand still. They constantly move laterally, up and down the line. Inside and outside. “The Colt” Shield from Krausko Sports allows the coach to duplicate these game-day conditions. Because “The Colt” has extended arms, offensive linemen can learn and practice proper placement of hands to ward off defenders. Coaches know foot position is vital to effective blocking. The Colt allows the coach to teach – and players to learn – proper foot positioning. Coordination between hand and foot movement is easy to see and simple to correct. Check out how your youth, high school or professional football team can perform a straightforward 2 on 2 zone blocking drill using Krausko blocking pads. Because “The Colt” Shield is safe to use, drills can be repeated over and over while techniques are being perfected. There is very little danger of a player being hurt. During even the most repetitive drill, the player is gaining confidence and strength, knowing what to do and how to do it. Football training equipment from Krausko also is flexible to use, allowing coaches to quickly adjust the drills to counter the opposing team’s strengths and exploit their weaknesses. Agility and body position are keys to effective offensive blocking, much more than power. “The Colt” Shield from Krausko Sports prepares offensive linemen to properly block even the quickest and most aggressive defensive linemen or linebackers. Proper technique is all about correct body position and lateral movement. The keys are to be agile, mobile and hostile. Equally important is the effective use of hands while blocking. Every player knows the frustration of having the refs call back a big play because of a blocking foul. “The Colt” Shield has extended arms, so offensive linemen and blocking backs can learn proper inside position. Depending on the same plan, coaches can adjust the drills for the best game-day performance. Muscle memory is the key to agility when executing proper blocking technique. Because “The Colt” Shield from Krausko Sports allows safe repeated drills which avoid injury. Players can quickly and properly react to each game situation. Most young offensive linemen like to concentrate almost totally on their hands while blocking. Coaches think differently, knowing proper positioning and coordinati on of the feet are vital to good balance and effective movement. Agility drills properly prepare a team for the next opponent. Have your offensive linemen perform a lateral footwoork drill utilizing The Muzzle blocking gloves, and you will force them to use quick feet and instant reactions to stay in front of defenders. With their hands essentially bound by the magnets in the training gloves, they can't reach and grab defenders. Holding penalties plague offenses and kiill drives. The Muzzle helps your offensive line to become more fundamentally sound and keep your quarterback off his back. Offense blocks don’t just happen. They continue to happen. Blocking for a pass play means forming a pocket to protect the quarterback. “The Colt” Shield duplicates this situation at game-day speed. Different block patterns are needed for running plays, of course. But on rushing plays, blocks must be followed. Contact with the defensive back must be maintained. Proper footwork is essential for the offensive lineman to accomplish this without drawing a penalty flag. Order “The Colt” Shield from Krausko Sports today to step up the footwork of offensive linemen. Offensive Linemen practice against team mates who are their friends. Who wants to punch your friend? “The Colt” Shield gives coaches the ability to teach pass rush techniques like punching and shedding blocks at full speed and full strength. Players learn effective use of hands needs to be two things – legal and violent. With “The Colt” Shield, players learn to give everything they have – every time. Proper hand position trains linemen to perform at maximum effectiveness, in the pocket or downfield. When the team is on the opponent’s goal line, nothing is more important than right placement and proper use of hands. Constant, safe repetition during practice drills will increase each player’s hand strength in addition to assuring correct placement. Coaches may utilize a simple pass blocking hand placement drill to train offensive lineman to get a jump off the snap and instantly win the hand position battle with oncoming defenders. Individual battles are often won or lost immediately post-snap. Teach your linemen to win the matchup right off the bat using The Colt blocking pad. The Muzzle® offensive line training gloves drill proper hands-in, thumbs-up bocking technique, forcing players to improve their footwork and eliminate reaching and grabbing. Training a youth football team puts greater emphasis on safe, effective teaching. Younger players think a lot about beating up the other team and a whole lot less about not beating up themselves. The Youth Colt blocking shield lets coaches safety teach proper blocking moves with much less danger of injury during practice, and less wear and tear on the bodies of promising players. Their muscles and bone structure are not fully developed. Every player – running back, guards, centers, tackles, receivers – needs to learn how to win the game while doing as much as possible to avoid injury – to themselves and to the opposing team. Those fundamentals are much easier to teach – and learn – if coaches use “The Colt” Shield from Krausko Sports. Safe youth training gea> like “The Colt” Shield will help keep more young players (and their parents!) in football for the long term. Buy football training equipment and have the fundamental advantage against teams.